The Dormition of the Virgin is one of El Greco's early Cretan works, painted some time before 1567. It wasn't until 1983 that the artist's signature, which he used to sign all of his paintings, was discovered on the central base. 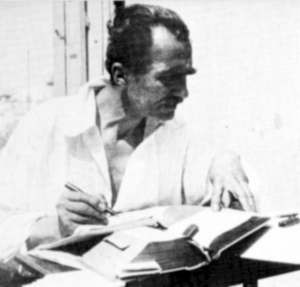 Throughout his career, the artist always signed his works with his Greek name, Domenikos Theotokopoulos. The discovery of this signature greatly advanced our modern understanding of El Greco's early works and influences, and it led to the discovery of other paintings by the artist. El Greco's The Dormition of the Virgin takes its theme from a theological concept which has been the subject of both art and worship for thousands of years. 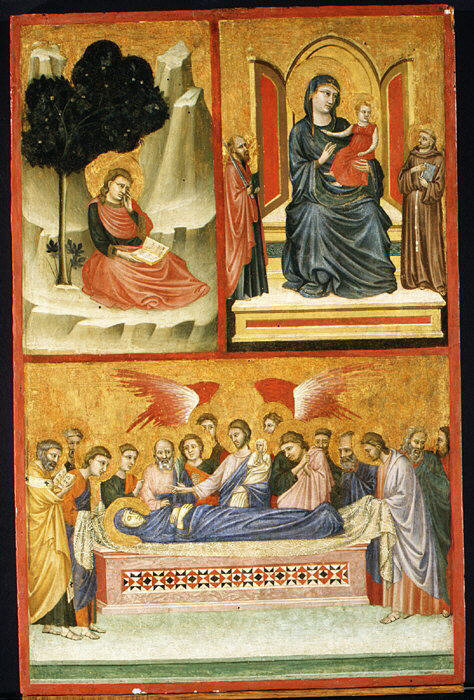 The Dormition, or Assumption, is the belief that when the Virgin Mary passed from this earth, she didn't die but rather slept temporarily until her soul and body were taken up to heaven and reunited. El Greco's The Dormition of the Virgin is a mix of Late-Byzantine and Italian Mannerist stylistic and iconographic elements. When El Greco set his sights on this icon, one eye looked back in reverence to the traditions of Byzantine iconography, while the other looked ahead in anticipation of his budding Mannerist style. There s a consistency to the composition of this iconographic image. 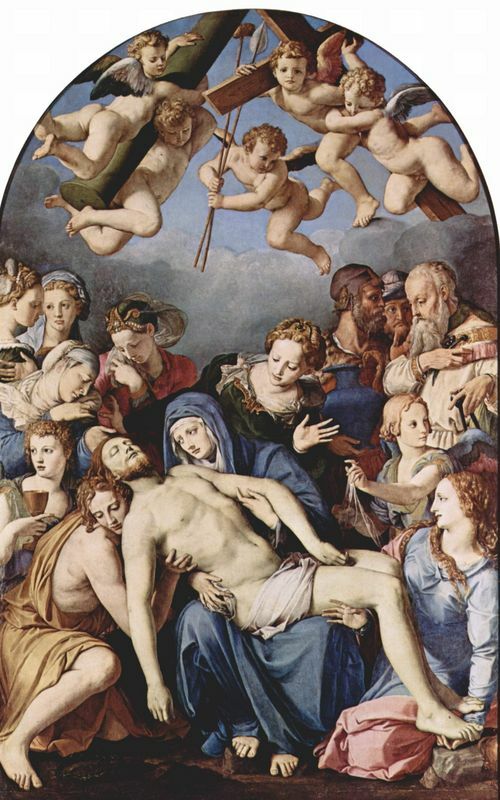 The Virgin is very much central to the image, lying with her arms folded on her chest. A vertical approach is evident and is formed by the figure of Christ who looms above Mary, holding her soul in his hand. There are two apostles at the extremities of the horizon and a second horizontal plane is created by groups of Apostles and bishops. As was the case with other versions of this work, the vertical is accentuated by the angel at the top center. El Greco's color palate of warm gold tones, shows the Italian influence on his earlier career. The golden tones are broken up by shimmering red of the garments, and the brightest color is that used to paint Mary's halo, in the foreground of the image. In both its iconography and technique the painting demonstrates the artist's origins and training in the traditions of late-Byzantine painting. The lighting is harsh and may of the figures in the upper part of the composition appear blurred. El Greco used a bristly brushstroke when creating this piece, adding to its harshness. A number of other iconographic works of the Dormition of the Virgin have been created throughout Western art history. Many of these were produced in the few centuries before El Greco's, suggesting that they might also have been inspirations for the Spanish Mannerist's early work. 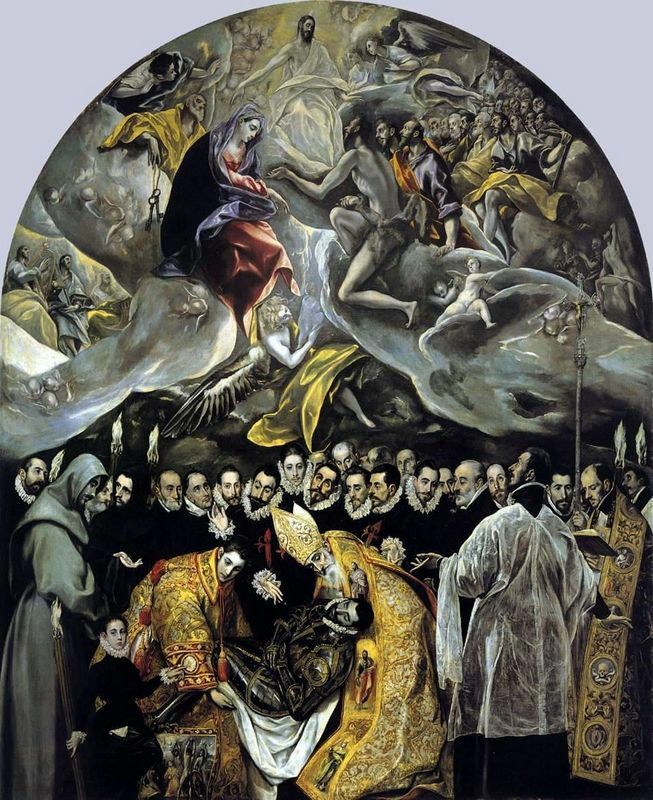 El Greco's Dormition of the Virgin is often compared to his later work titled The Burial of the Count of Orgaz. Many critics point out the similarities in composition, and use this comparison as evidence of El Greco's Byzantine influence throughout his artistic career. In El Greco's Burial of Count Orgaz, we find the body of Orgaz supported by two saints, Stephen and Augustine, just was we see Mary attended by two Apostles at the bier. Moreover, a similar "rank" of spectators forms the horizon at the center of the composition in Orgaz just as it does in Dormition. As with the Dormition, Orgaz features a small figure in the foreground. In the latter work, instead of an angel with a sword, it is the artist's cherished son. 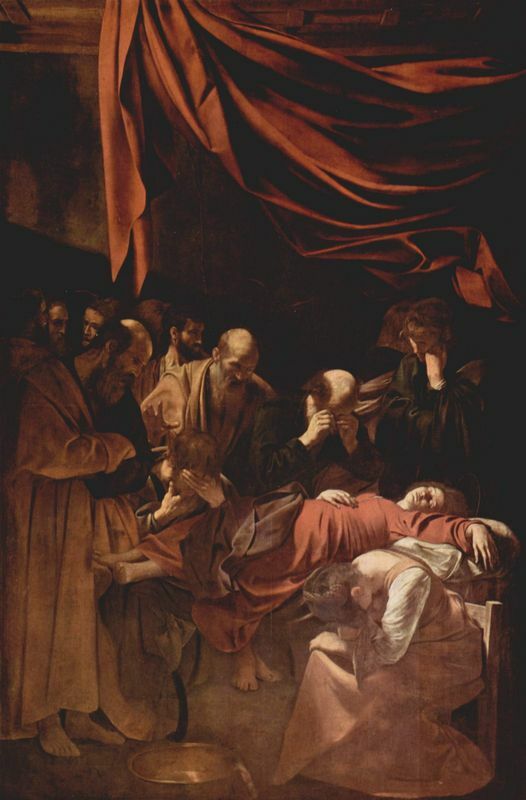 The Dormition of the Virgin is one of the El Greco's earliest surviving works. In fact, this piece was only recently discovered as belonging to El Greco. El Greco completed this work in his birthplace of Crete, Greece before setting off for Italy to study under Renaissance greats. In Rome El Greco opened a workshop and spent a great deal of time developing his style, adopting elements of both Mannerism and the Venetian Renaissance. 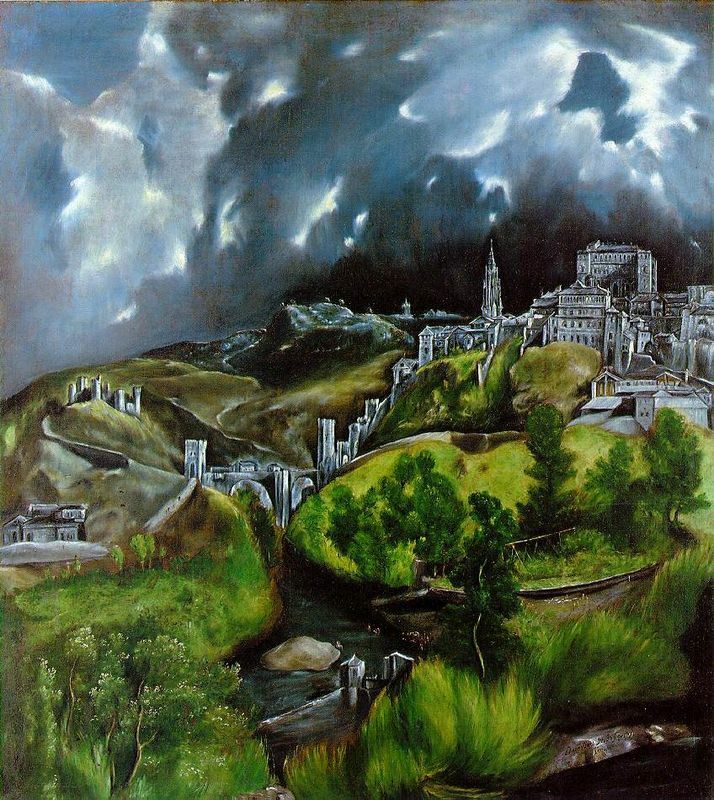 However, it was after relocating to Toledo, Spain that El Greco truly blossomed. There he received several major commissions and produced his best known paintings. The artist gained notoriety for his highly expressive and visionary religious works and rarely ventured away from this genre. When he did, however, he created compelling portraits, landscape paintings, mythological works and sculptures, and those produced during his later years are particularly notable for their undulating forms, epic scale and expressive distortions. El Greco regarded color as the most important element of painting, and declared that it had primacy over form. In his mature works he tended to dramatize rather than describe and the strong spiritual emotion of his works directly affects the audience. Mannerism was a period of European art history that followed close on the heels of the Renaissance. In fact, this period is sometimes referred to as the Late Renaissance. While some critics consider Mannerism as part of the Late Renaissance, others classify this as a distinct period occurring between 1520 and 1600, when naturalism gave way to the surreal. While El Greco was technically considered a Mannerist, this early work is very reminiscent of Byzantine art, by which El Greco was heavily influenced. El Greco's works were worlds apart from his contemporaries due to their dramatic and expressionistic style and it was not until the 18th century that his unique approach was appreciated. The artist is seen as a forerunner of both Expressionism and Cubism and he also inspired writers and poets including Rainer Maria Rilke and Nikos Kazantzakis. 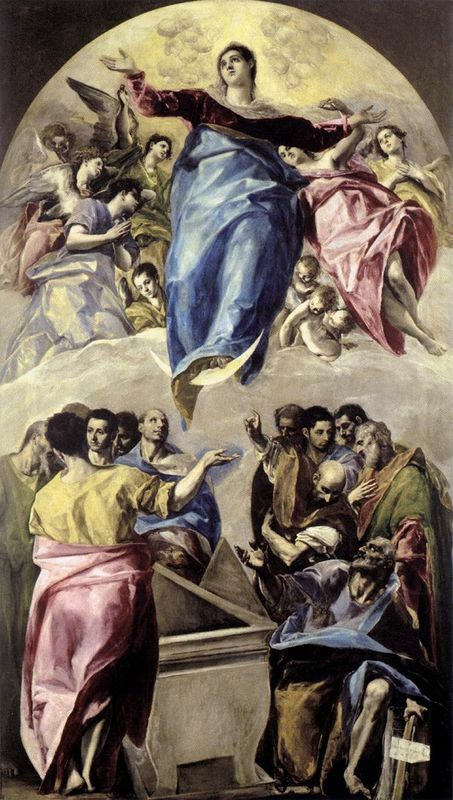 Marrying Byzantine traditions with Western painting, El Greco is renowned his elongated figures and often fantastic pigmentation and because of this many modern scholars believe that El Greco is a truly unique artist who broke the rules of all conventional schools. 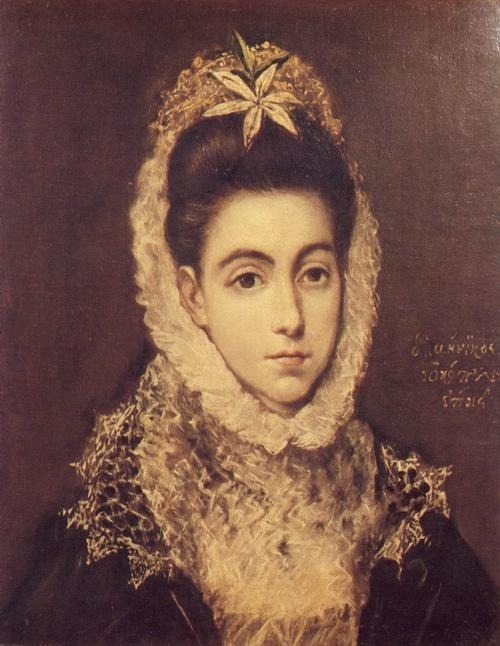 Many regard El Greco as one of the finest painters of Spain, if not all of Western Art. To read more about El Greco please choose from the following recommended sources.